afternoon nap, a restart of the day that became a habit when I toured fulltime. I’d arrive in town, check in to the motel and grab a “restart” before heading to the venue. I am grateful for naps when I can get them, and grateful for days that are too filled to allow time for them. Either way, I am grateful. Yesterday began with a rainy drive to Wanchese to take the Prius in for maintenance and then waiting for it. I am grateful that we have (at least what seems to be) a good local mechanic. 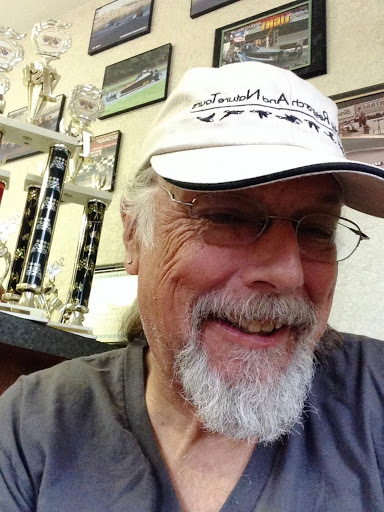 I do tend to put the miles on a vehicle and I have sat there by their drag racing trophies many a morning and waited while the oil was changed. Later in the day, there was a clearing in the rain and I had a lovely brisk walk around the harbor in Manteo. 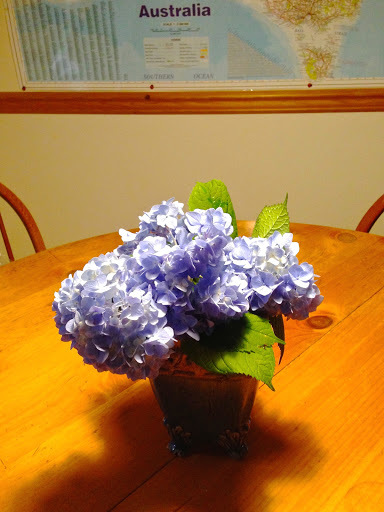 When I returned, I picked a few Hydrangeas from our yard for Lynn. They are my favorite flower. I am grateful. As most of you know, I have begun to blog these Living Gratitudes. I will be recording the trip around Oz that we begin in August and I will probably continue to cross post on the facebook as well. I am doing that with this post. I am just learning how to work Blogspot and the Blogo offline writing app. I do enjoy communicating and sharing the things for which I am grateful and I am most grateful for y’all with whom I get to share them.